See this? This is the dip we ordered at a family favorite restaurant last night. 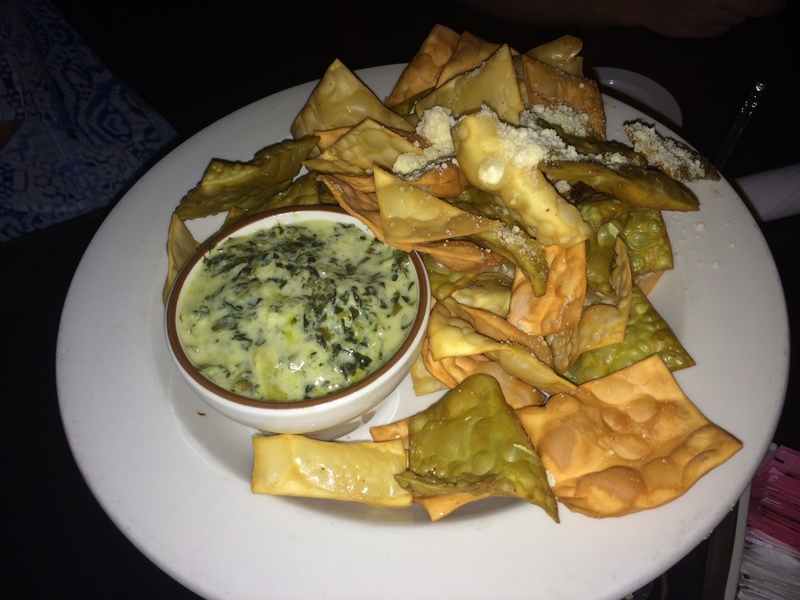 The James Gang gathered to celebrate anniversaries and birthdays and this dip is always on the Must Get Appetizer list whenever to go to Nomad’s. After some fiddling and a lot of trial and error, here’s my close approximation of the very yummy stuff. Melt butter in a large saucepan over medium heat. Add onion and cook until soft. Stir in spinach, artichokes, cream and sour cheeses, salt, and 3/4 cups each of Jack and Parmesan. Stir until well blended and heated through. Pour mix into a 1/2 quart casserole dish and top with remaining shredded cheeses. Bake in 350 degree oven until cheese starts to brown, about 10 minutes. Warning, this stuff is addictive, which is why I make it in big size–about four cups. It can also be made with low fat/no fat cream cheese and sour cream. I may have to make some as comfort food to get through to the end of BLUE MOON. See the word counter? Yeah…I’m over 30K. And somebody dies. Shhhh. This entry was posted in Writing Life and tagged family, food, recipe, Tuesday Treats, writing. Bookmark the permalink. You, madam, are evil. First you drop a yummy recipe on us, then you follow up with a bombshell like ‘someone dies’?? Don’t make me kill Zeke as payback. Cuz I’ll do it. I will. You can’t kill Zeke. Well, you can, but then who would Jo have to fight with? And you know me. I’m all about the blood and guts. And yes, people die. Though unlike TRUE BLOOD, they aren’t killed just to be killed. Ahh don’t kill anyone! Sheesh! You and Linda always have to kill someone! 😛 BTW–I never have. KILL Someone?? ?– Silver were talking about the WOLVES!!! !